CONFIRMED!! 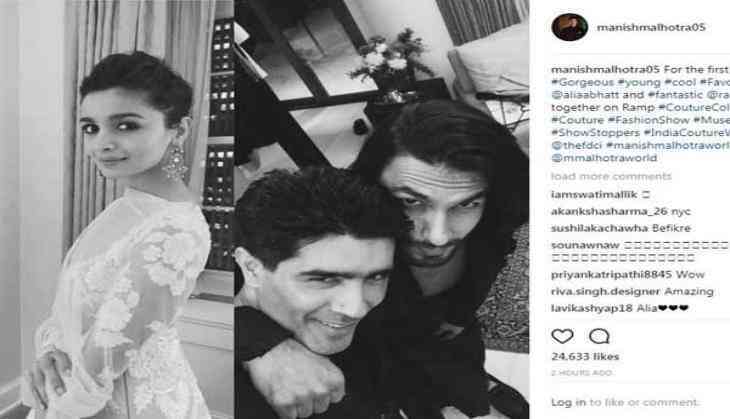 Ranvver Singh and Alia Bhatt are going to be the showstoppers for designer Manish Malhotra at 2017 Indian Couture Week. The ace designer posted a photograph on his Instagram profile a day prior to the finale and confirmed the news. He captioned the image, "For the first time ever #Gorgeous #young #cool #Favourite @aliaabhatt and #fantastic @ranveersingh together on Ramp #CoutureCollection #Couture #FashionShow #Muses #ShowStoppers #IndiaCoutureWeek2017 @thefdci #manishmalhotraworld @mmalhotraworld." The monochrome selfie sees Manish and Ranveer bonding over fittings. On the work front, Ranveer is currently filming for Sanjay Leela Bhansali's 'Padmavati' which also stars Deepika Padukone and Shahid Kapoor. 'Padmavati' will see Deepika as Rani Padmini, Shahid as Raja Rawal Ratan Singh and Ranveer as the main antagonist Alauddin Khilji. The flick is slated to release on November 2017. Flipkart Moto sale: Get the smartphone of Rs 25,000 in just Rs 5,999; click to know How?